Having a power speed drill at your home is quite important for all the small and even few of the big tasks as well. You should also have a cordless variable speed power drill at your home so that you can sort out all the work yourself easily. Cordless variable speed power drills are what people love the most. This is because they are easy to handle and use as well. You can perform any task even in the tightest of spaces as they are usually compact. It’s 2017 and it is the modern year of all the electronic items. This is why we would also recommend you to buy cordless variable speed power drills in 2017. The following review will discuss the Top 5 Cordless Variable Speed Drills in 2018. Makita is a strong name when it comes to mechanical tools and equipment. 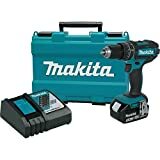 The Makita XPH102 18V LXT Lithium-Ion Cordless 1/2″ Hammer Driver-Drill Kit is a great drill kit by Makita. Having a variable speed option, you can shift between 0-600 and 0-1900 RPM for a diverse drilling experience as well. The drill has a 4-pole motor which gives 480 in. Lbs. of torque which is quite sufficient for all your drilling requirements. The drill has protection technology which gives increased protection against dust and water in extreme conditions. It weighs nearly 4 pounds with battery and is only 7¾ inches long which makes it quite compact. The ergonomic soft handle grip gives a better precision and accuracy on the work. Also, it has been equipped with Star Protection Computer Controls which help in protection against overloading, over-discharging, and over-heating. The best part is that you have a great 3-year warranty with this drill so you better not worry regarding anything. Porter Cable is also a good brand for electrical items such as a compact cordless drill. The PORTER-CABLE PCC606LA 20-Volt 1/2-Inch Lithium-Ion Drill/Driver Kit is a great drilling kit for all your needs. It comes with a single 20-volt battery with 4-hour charger as well. It has a high-performance motor of 330 UWO. The 20-volt drill driver is ideal for metal, wood, and other applications as well. Also, it has a battery indicator which means you don’t have to charge it before it ends. Many of us often feel that our devices will end up as they don’t have indicators but this one has it so use it to the maximum. The variable speed gearbox can run on either 0-400 or 0-1600 RPM. Being compact and only 3.5 pounds in weight, it becomes a great choice for users. The company does not have a very long warranty policy but they surely do offer a 90-day warranty so that you are satisfied with the product overall. 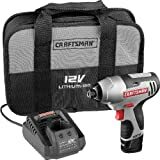 The Craftsman Nextec 12.0 V Variable Speed 0-2200 RPM 1/4″ Li-Ion is yet another combo kit which includes 4-piece set with 1/4″ impact driver, 12V Lithium-ion battery, charger, and case. It can easily be used for several purposes such as auto work, metal, woodwork, and further many other items can be drilled with its variable speed option. The speed is variable between 0-2200 RPM for maximized precision. The drill has a very strong motor which generates 810 lbs. of forward/reverse torque for one-handed easy drilling. Electric brake and LED work light are additional options available which will make your work safe. The drill has a 12-volt battery with a quick charger as well. You can use it for some time with a quick 30-minute charge boost. 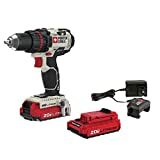 The Black & Decker LDX220SBFC 20-Volt MAX Lithium-Ion Drill/Driver with Fast Charger is a great drill by a great and a very well renowned company. It has a 20-volt MAX lithium-ion battery which helps in holding the charge longer between uses. This ultimately results in a longer life cycle as well. Having an 11-position clutch provides accurate control for drilling and screwdriving tasks. Variable speed option is available and you can fast charge the battery within 35-minutes which prevents any sort of down time. The complete package includes the drill/driver, one battery, charger, storage bag and a double-ended screwdriving tip. The compact and lightweight design assists in getting the best experience and you can also easily use it in all the tight and confined spaces. Ryobi seems to be new in the market but the product still becomes one of the best of 2017. 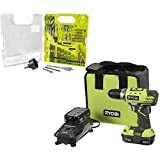 The Ryobi P1811 ONE+ Compact Drill/Driver Kit with Ryobi A98601G (60 Piece) Drill Kit is a complete kit which includes the P208 compact drill/driver, a 60- Piece Drilling and Driving Accessory Kit, dual chemistry charger, 2 each P102 18-Volt ONE+ compact lithium-ion batteries, tool bag, and operator’s manuals. This bundle is backed by a 3-year warranty for your maximum comfort and stress-free purchasing experience. Being only 2.7 pounds in weight, the drill can easily be used anywhere easily. With 24 torque options, you can adjust as per your requirements and also adjust the speed to two modes 0-440 RPM or 0-1600 RPM as per your requirements. The best part is that you don’t need to collect individual tools from anywhere and make a toolkit. You already have everything. No customer reviews but it seems to be a great product. Hope it works out well in the reality too! Buy any of the best cordless variable speed drills for your home and do leave your experience in the comment section below.